Hemavist is a lipid formulation of a novel gadolinium contrast agent for magnetic resonance imaging, designed for normal 1H MRI enhancement. Current 1H contrast agents are rapidly cleared from the circulatory system, and are generally limited to the imaging of blood/brain barrier disruptions. Hemavist's high relaxivity and persistence in the bloodstream lowers the effective imaging dose by an order of magnitude relative to its chief competitor, Magnevist®. More importantly, its persistence in the bloodstream opens a new pathway to angiographic evaluation of cerebral and cardiac perfusion. These rodent images show Hemavist's impact on blood flow imaging in a study performed by Dr. Tom Brady at Massachusetts General Hospital. Conventional MRI shows no vascular detail. 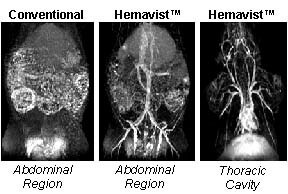 Hemavist clearly images the lower descending aorta and its branches in the abdominal region, as well as the carotids and pulmonary areteries in the thoracic cavity. Rodent studies demonstrate the quantitative elimination of Hemavist .